I really enjoyed Mohsin Hamid's The Reluctant Fundamentalist on audiobook, so I was excited to find How to Get Filthy Rich in Rising Asia in the same format. It is written in a similar format, the rare second person that always reminds me of Choose Your Own Adventures stories from my childhood. Hamid is much better at actually creating a plot and developing characters than the authors of Choose Your Own Adventures, which is much more difficult than you would think considering that no one in this story has a name. 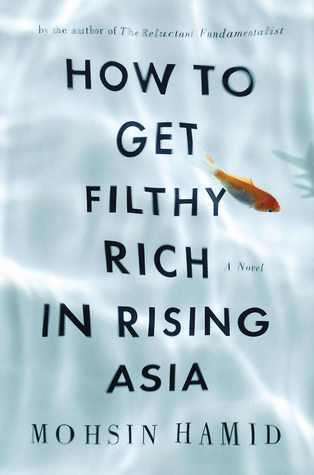 How to Get Filthy Rich in Rising Asia is, I think, set in Karachi or Lahore, Pakistan. I have never been to Pakistan, but I imagine it's fairly similar to India in that if you pay a lot of bribes and do a couple of shady things and know the right people, then you can probably be very successful. Hamid starts the story with you in a small village, moves you to the city for education, has you leave school to start working, and then make your way up the economic ladder, with all the privileges and problems that come with it. I found this book to be a very empathetic and moving account of trying to make it big in South Asia. It reminded me a lot of Aravind Adiga's The White Tiger, except that it's much kinder and not quite as cynical as that book is. The book is ostensibly a self-help guide (hence the use of the second person), and every chapter is laid out as a step on the path to success. Parallel to the story of the young man's rise to prominence is a love story; he knew a "pretty girl" when he was growing up, and she too was determined to make something of herself. Her path leads her away from and back to our hero, and as a reader, I was so thrilled any time their stories came together. I also really enjoyed reading about the main character's relationship with his wife and son. There was so much nuance there, so much miscommunication and missed opportunities, and so much yearning for more than is on offer. I loved how well Hamid brought that to life. Mohsin Hamid is an author I plan to keep my eye on going forward. I've enjoyed everything (ok, two books) I've read by him so far, and I appreciate his unique narrative voice in the midst of a lot of books written in first or third person :-) And if you're the kind of reader who enjoys a good audiobook, I definitely recommend this one on audio! I listened to this on audio as well: wow, what a fantastic tone! There were many times when I laughed aloud while moving around the city, listening intently. (Which isn't always the case: I am easily distracted when listening to a book, especially when out and about.) But I wasn't aware, while moving along, that my heart had gotten so entangled, despite the seemingly objective style. I was surprised, at one point (shan't say when, to avoid spoilers, but it will be obvious to anyone who has read it), to find myself reduced to tears. He really got to me.